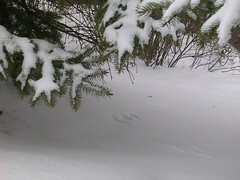 What I saw today was bunny tracks. A few years ago, I saw a rabbit most days when I walked by the Centrepointe Theatre. He seemed to hang out on the hillside (very steep but not deep) that ran down to the driveway access to the theatre basement. 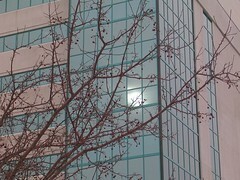 I saw evidence of him in the early winter but then nothing until one day in the Spring, I saw his little body as the snow melted under one of the trees beside the building. It was very sad. 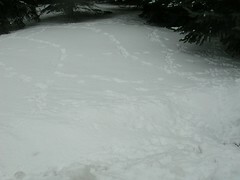 Today, I noticed bunny tracks for the first time in the years since his demise. 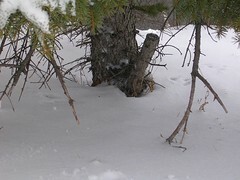 There is some cover on this hillside - some sturdy evergreens. But it doesn't look like there are many resources and I am not sure where the rabbit would have its home. In this third photo, the dark grey at the top of the photo is the driveway at the bottom of the steep slope. 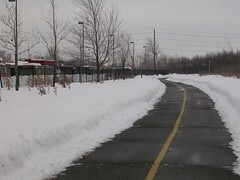 I'm pleased that the bike path behind the Baseline transit station is being kept clear. Now I can walk in relative quiet and saltlessness, instead of trekking through the station itself. 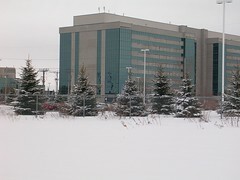 I also noticed the fir trees covered in picturesque snow forming a wind break at the edge of the giant parking lot that once belonged to Nortel but now belongs to the City. They looked so classic that I snapped their picture, even if the picture itself is not great. And it was a grey and dull day today but for all that, nice and mild. I'll take this over 30 below any day. Merry Christmas and Happy New Year to everyone! I have had the pleasure of family visiting but now they have gone home and I have been looking for something to blog about. 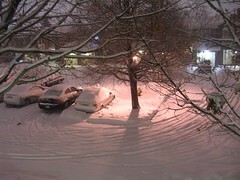 We are currently getting yet more snow but I didn't take the camera with me when I ran out to the store today. 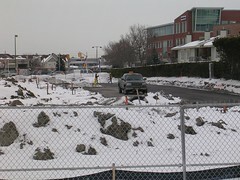 I checked what pix were on the camera and the only one for this blog was from yesterday, showing they have finally removed the giant snowbanks from the main road. It makes it so much easier to get around, without having to scale small mountains. I'll have to take the camera with me when I head to the gym tomorrow and see what there is to see then. 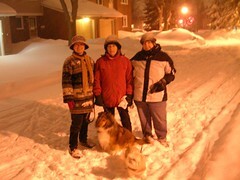 The paper today said we set a new record for the most snow on one day in December, 37 cm (14 inches). 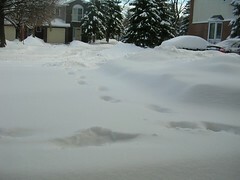 We also have a record amount of snow on the ground, 75 cm (29 inches). But I haven't seen any signs of snow blowers removing snow yet. So far, the snow has just been pushed around. At least today there is a way off the shopping mall premises and onto the street, even if you do have to walk around a little to get back on the crosswalk. People will make a path if they always walk somewhere and this is no exception. 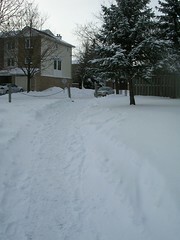 Apparently, I rejoiced too early that they had shoveled the path between our subdivision and the next one. Now it has been blocked at our end by a wall of snow. 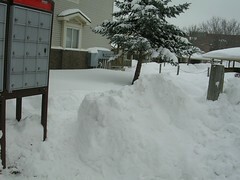 But people have still managed to trample a narrow path and have got around the wall of snow by snaking in at the mail box where the snow has been shoveled away. Here's how it looks from the other end. 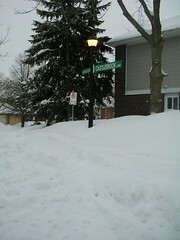 Here is the street sign, holding its own against the pile of snow. 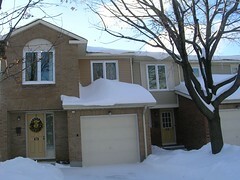 Thank goodness we engineer our roofs for snow load. And here is that car! I thought it was a goner until Spring but I saw today that someone had shoveled it out. 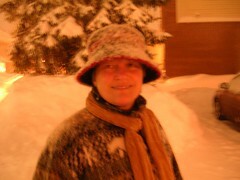 I don't remember seeing that much snow all at once since the 70s. 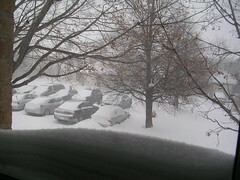 This one was taken from the upstairs window (note the snow building up on the sill) in the early afternoon of the 16th. 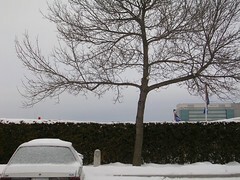 Note the car nearest the tree. They haven't driven it since the snow came, so it has a head start being buried. 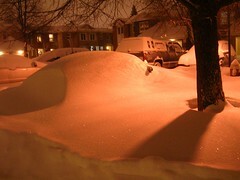 This is the same car, about 6 hours later. All you can see now is the side mirror. We went for a walk around 7pm and took several hand-held photos. 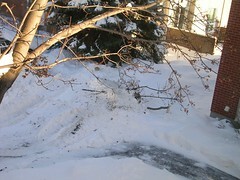 The plow had been around once, to clear the streets, but nothing had been done about driveways or anything else. 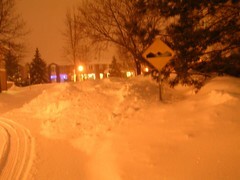 The bump sign warns of a speed bump but it's buried under the ton of snow. That's your normal height street sign. Sorry this is blurry but that's what happens with no flash. But it looks nicer than the flash. When you have a dog, you have to get out! I am reminded of the old saying about snow on the roof. 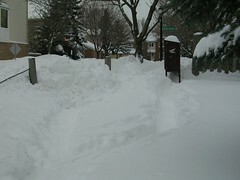 The next day, there were no sidewalks, except where private plows had been at work. 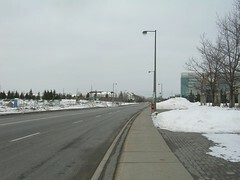 I had to walk on the street to get to the point where I could cross to a cleared sidewalk. 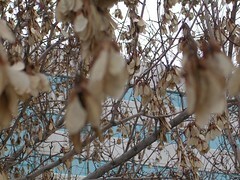 I've taken several photos of this tree in front of the old Nepean City Hall. 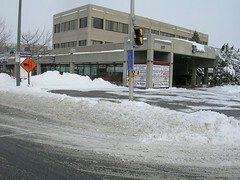 The snow around it has not been piled there - that is just buildup from falling snow. 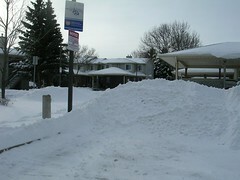 The big problem is where to put all that snow. You really have to chew it up with a snow blower, spit it into a truck and take it away to the snow dump. Here, it has been piled at one end of a very large parking lot. 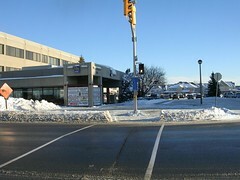 This is the northeast corner of Woodroffe and Navaho and it is owned (up to the public road allowance) by the shopping centre. 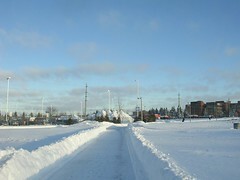 The centre's plows have been out and done a good job of clearing snow - up to the point where the land turns public. You can get almost all the way up to the road and then there is a three foot snowbank blocking your way. There was a "path" formed by a few foot prints in the bank so if you put your feet in the holes left by the intrepid first person, you could cross the street. But you couldn't push the walk signal buttons on the east side of Woodroffe and if you don't push them, you don't get the walk signal. So you have to take your life in your hands and run across when cars are making the left turn. Good grief. 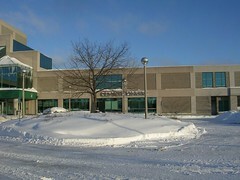 The snow clearing happened yesterday. Unfortunately, I think we are to get more snow today. 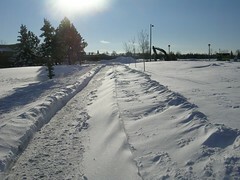 Some paths were cleared early in the day but by the afternoon, they had drifted in with blowing snow. The wind was quite stiff yesterday and even though the temperature started mildly at about minus 3C, it slid during the day and ended up at minus 16 this morning (3F). Currently (at 10am) it is still -16C but the windchill makes it feel like -24 (-8F). Hmm, doesn't sound as cold in Fahrenheit. 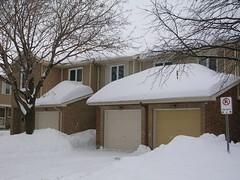 The wind continues to sculpt the snow on the roofs. I called the condo corp about getting that overhang knocked off before it falls on someone's head. It's only because it is right above someone's doorstep. 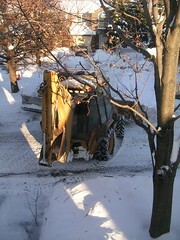 Then later in the day, the machines were out clearing snow in the immediate neighbourhood. I went to see what they were doing when I noticed them all stopped at the end of my driveway. I saw someone with a gas can but that's when I noticed they had broken off the entire branch of the tree in front of our house, the one that had the squirrel's nest on it. I am sure there were no squirrels in the nest, but it bothered me to see that the whole branch had gone. Part of it was in the driveway but the bulk of it had been shoveled off to the side and was sticking out of the main pile of snow. I know accidents happen but it's a little annoying. 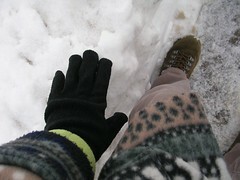 Yesterday, we got more snow. 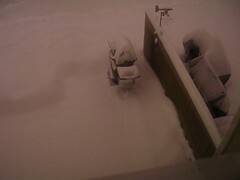 The weather guys say it was about 11 cm which is about 4 inches. Seems about right although it feels like more when you are shoveling it. But it was nice and light and fluffy, so for that we are grateful. Peter went around upstairs and took pictures out the windows at about 10 pm last night. 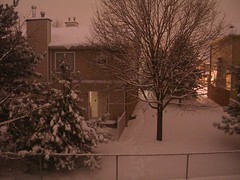 The snow was still falling and it looked like a winter wonderland. All the shots are hand-held with no flash, taken through the glass. 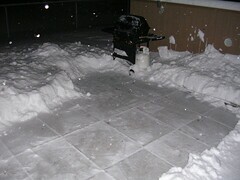 If we want to continue barbequing, we (meaning Peter) will have to shovel again. 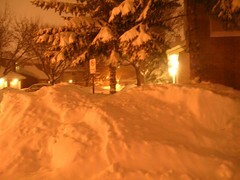 I took this one this morning, just before I shoved the snow out to the road so it can get plowed away. The plow guys will drag the snow out of the driveway but I like the little bit of work shoveling it and I also get neater edges doing it my way. It's snowing now but it was just threatening to do so when we took a walk in the park. Peter took the following photos and you will notice some of them are much better than my usual, which is why I'm giving him the credit up front. They have just paved the roads at the construction site! I don't think they have foundations in but there is asphalt down on the roads. 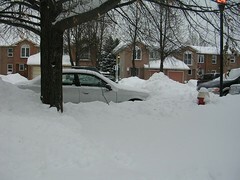 I wonder if it is to make plowing snow over the winter months easier? I would think that the heavy machinery will tear it all up by the time construction is finished but I also guess they know what they are doing. 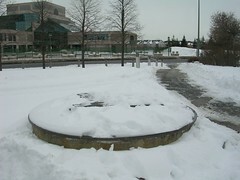 The burbling fountain at the entrance to the Centrepointe Park has been shut off for the winter (obvi!). 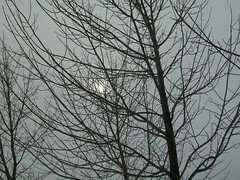 Here's the sun, trying to shine through the clouds and not being very successful. 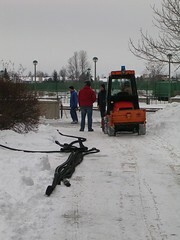 On the other side of the street, by city hall, the ice is being put in at the outdoor rink. 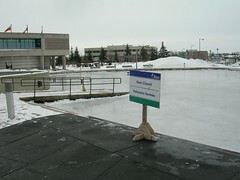 This is normally a reflecting pond (not very deep) and they take most of the water out and then make proper ice with a Zamboni. It still looks very rough so I think they have more flooding and scraping to do. I didn't hear exactly what they were saying but I assume they are going to be working on the ice. The hose is out and ready to go. And I found it interesting that two of the people were wearing hockey helmets. I don't think I've noticed that before but it makes sense to wear a helmet if you are going to be working on ice. 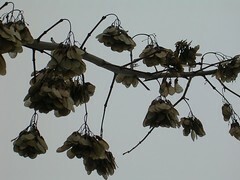 These small trees (or are they bushes) have all their seed pods still hanging on them. Not sure what kind of tree this is but the berries make a nice colourful touch to the winter scenery. 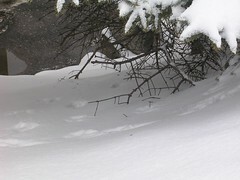 Finally, look at all those bunny tracks! I am not sure how many bunnies made them but they are everywhere. I can only hope they have a nice warm place to spend the night, somewhere I suppose, under all those trees. Last night on his walk home, Peter noticed some nice lights right in the immediate 'hood and went back out to take a snap after I brought him the camera. 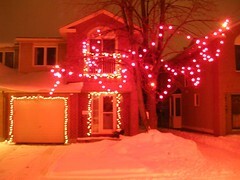 I have a giant bucket of lights in the basement and haven't deployed them since we lived in the country. One day. 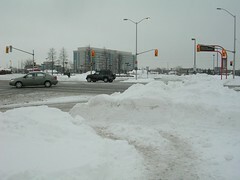 On the way down Centrepointe this morning, I thought I would try to give an idea of how tall the snow banks are. I stood right next to one and placed my hand on top of it, without bending over to that side. Granted, I am only 5'2" but I would say my old Labrador would have had a hard time seeing over them! The photo doesn't look like much but the sky is really dark in the north, past the hedge. It was about 8:30 on the morning when I took this one, and it was snowing when I headed home at about 11 am. Here's the bike path on the way home. If you look really closely, you can see the snow against the buildings. You can always click on the photo and it will take you to Flickr where you can make the photo larger. It looks like a plow has gone by on the left (or south) side of the path and hasn't returned to clean the bit of drifting snow that is starting to accumulate on the right side. I am not sure why the snow is interspersed with spots of bare pavement, however. This is what an excess of road salt looks like. 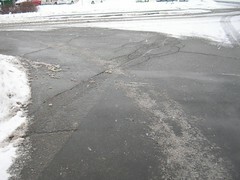 This is over at the old Nepean City Hall and the salt has been this way for several days now. I had a comment yesterday about too much salt and this has been one of my constant gripes over many years. However, I am not sure if complaining to city hall (or whoever) would do much good. I fear we would get a response that said something about better too much so people don't fall down, sort of thing. And the amount of salt is not consistent so I think it depends on who is putting it down and how they were instructed, etc. I do remember the days when I had a dog and the poor thing would end up holding one paw in the air and then she would have to stand still so she could hold two paws in the air, because the salt stung her feet. Maybe a petition is in order? Finally, this garbage thing has always been an issue with the condo and probably always will be, I don't have photos but this morning on my way out, I noticed one particular blue box piled very high and precariously with plastic items. They were a foot above the rim of the blue box and I had a feeling that the garbage collectors might not be too careful when they picked up that box. Sure enough, on the way home I saw that all the garbage had been picked up but that beside the overturned blue box were many yogurt containers, a jar, a plastic bottle, and some other things - all of which had been perched on top of the other contents of the blue box. I have learned that it is not in the garbage collector's job description to pick up stuff that falls out of the bag, or in this case, off the top of the recycling box. It is up to the homeowner and garbage-putter-outer to make sure the garbage is contained and in such a format that the garbage collector just has to grab it and toss it in the truck. So let's be careful out there people. 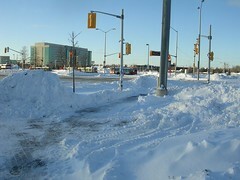 We're getting there with the clearing of snow for pedestrians. But we still need the snow blowers to come along and chew it up and spit it into trucks. 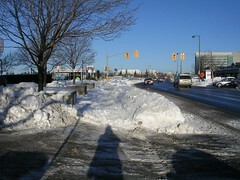 For some reason, this one little stretch of sidewalk in front of a building for handicapped folks was not cleared. The main exit to the handicapped busses is cleared (that's where I'm standing) but not the sidewalk leading over to the marked crosswalk. Up at the crosswalk itself, the banks have been completely cleared away so you can cross the street where the lights are. 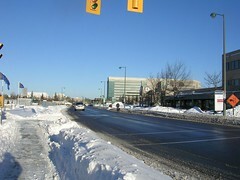 I snapped this photo when I did to catch the cyclist braving his way down Centrepointe. Finally, the walk signal has meaning! 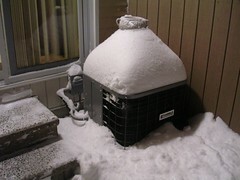 Out behind our house, it is apparent that we won't be needing the air conditioner for a while. The pot perched on top of it normally holds a candle in the summer, and hides among the leaves of whatever herbs I'm growing in the garden. In spite of not needing the air conditioner, Peter is still out there, bravely barbequing for his summer-starved wife. 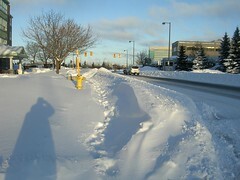 A little more snow overnight and then we got wind and now we have drifts. The weather people on the internet say we got "21.2 mm" of precipitation, which I believe should be 21 cm of snow. That's 8.3 inches for non-metric types. Seems like more. 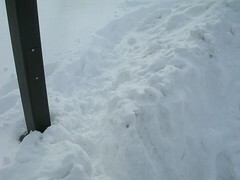 Don't try to get across the street at this crosswalk - not only can you not walk on the sidewalk because of the drift, and can you not reach the button for the walk signal, you couldn't make it over the snow bank to get onto the street. 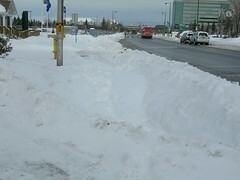 And even if you made it over that snow bank, you'd be faced with this one on the other side. Thank goodness there are the all-important cars that get things plowed for them first, so you can use the driveways and entrances into malls. 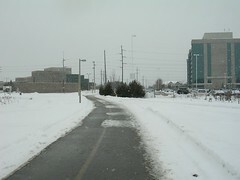 At the short-cut through Plunkett, the snow has been piled high and blocks a paved path. People have trampled a narrow path around the snow piles but I may start walking out another way. Fortunately, the main link between Castlebrook and Plunkett has been plowed this year, for the first time in years. It's sort of no-man's-land but someone has got the message that people use it and now it has been plowed. Thanks! 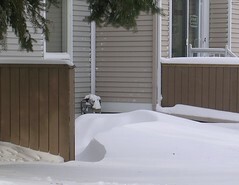 I thought this little snow drift was perfectly shaped, except it must make it difficult for the resident dog to get out!